Prototype: German Federal Railroad (DB) type Abi "Donnerbüchse" standard car. 1st and 2nd class. The prototypes for the two-axle cars for normal passenger trains originally had wood roofs and interior walls. Later they were built entirely of steel. The type 29 was built right from the start entirely of steel. By todays standards these cars were very noisy and rumbled a great deal. Consequently, a popular nickname for them was Donnerbuchsen or Thunder Boxes. 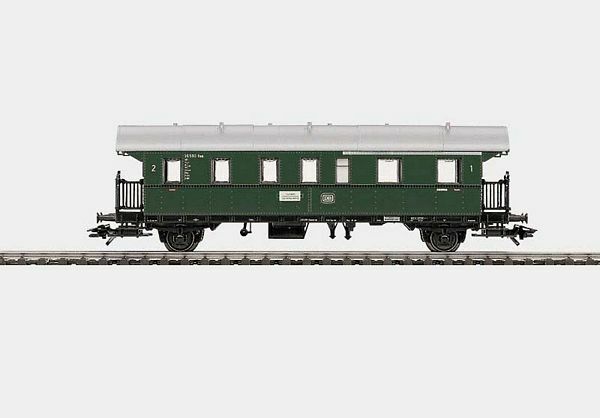 On the German Federal Railroad they were indispensable in the postwar period for commuter and branch line traffic.